This article discusses the dangers of using price per square foot as a sole means for valuing a particular property. The practice, while common amongst some real-estate brokers, leads to significant under or over-valuation in the majority of cases. In this brief paper, we provide the statistical underpinnings for our argument illustrated with real-world data. Our aim is to provide support for the seasoned appraisers’ adjustment methodology with arguments and examples that can easily be shared between real-estate professionals. In many areas of the country, real-estate professionals are under increasing pressure from clients to provide quick, cheap valuation of property that is in distressed, bank owned or short sale situations. This pressure, in part, has led to an over-reliance on a single unit of comparison: price per square foot as a guiding measurement for real estate valuation. In this article, we explore the use of price per square foot as a unit of comparison. We provide the statistical arguments for why this metric, when used alone, can provide misleading results. Simultaneously, we explore how simple fixes such as computing an average price per square foot based on nearby sales are insufficient to provide a reliable valuation. Our exploration is grounded in statistical theory but illustrated with real-world data that we anticipate will be useful to all real-estate professionals. The results of our exploration not only highlight the potential danger of relying on a single unit of comparison for valuation, but also highlight the important role real-estate appraisers play in property valuation. In the following sections of this article, we begin our exploration of price per square foot by looking at recent residential sales from Clark County, Washington. In the process, we illustrate the pitfalls of simply relying on price per square foot to arrive at correct valuation, even when we restrict properties to those of a specific class (e.g., three bedroom homes). Next, we look at a situation where it may be reasonable to use price per square foot alone as a predictor for sale price. Finally, we discuss the issue of comparable properties that lies at the heart of the problem with using price per square foot alone to predict sales price. We conclude by examining the role of the professional appraiser in navigating this landscape to provide accurate real-estate valuation based on the practice of applying adjustments to a small number of comparable properties. Price per square foot is a well-established metric for valuation and listed as one of two typical units of comparison in the current edition of The Appraisal of Real Estate. This is for good reason. 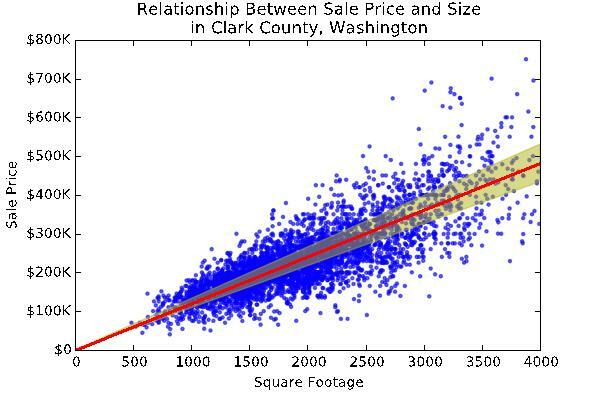 Consider Figure 1 that shows the relationship between sale price and size for 4475 sales of properties in Clark County, Washington with less than 4000 sqft of living area and selling for less than $800,000. Appraisal Institute, The Appraisal of Real Estate, 14th ed. (Chicago: Appraisal Institute, 2013), 386. The graph shows a clear correlation between the two variables. Price increases as square footage increases. The red line through the points shows sale price predicted by the average price per square foot. If all the data points fell exactly on the line, that would indicate that square footage multiplied by a specific rate per square foot would perfectly predicted sale price. However, this is not the case as evidenced by points that are off the red line. We can further explore the quality of the prediction made from this single unit of comparison by more precisely determining how far away points in Figure 1 tend to lie from the red line. The shaded yellow region in Figure 1 contains the points that are within 10% of the average price per square foot. Qualitatively, we can see that many points lie outside of this region. The facts indicate that using the average price per square foot alone as a predictor for sale price would result in more than a 10% error in many cases. 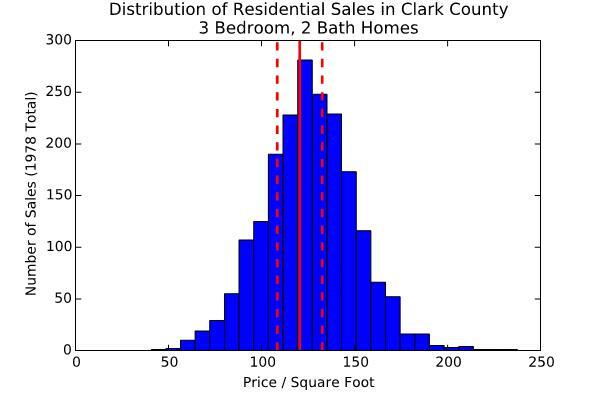 A histogram, like the one illustrated in Figure 2, can show a clearer picture of the distribution of these points around the average price per square foot. In this figure, we see how many sales occur at a given price per square foot. As expected, the peak of this curve occurs very close to the average value of $120/sqft (solid red line). However, the fact that this plot is not a single thin bar also indicates that there is substantial variation in the price per square foot. When using this unit of comparison as a tool to determine value, it is this variation from average price, illustrated by the width of the bell curve, that should be of concern. The dashed red lines in Figure 2 again show the sales that lie within, and outside of, 10% of the average price per square foot. Figure 2 illustrates that a real-estate professional relying only on the average price per square foot to predict the final sale price would be off by more than 10% more than 3 out of 5 times. In other words, more than 60% of the area covered by the blue bars in Figure 2 is outside of the range between the dashed red bars: [$108/sqft-$132/sqft]. On a $300,000 sale, this error amounts to at least $30,000; more than enough to cause concern amongst a typical prospective buyer or seller. In an attempt to improve the accuracy of the price per square foot unit of comparison, one might attempt to limit the properties under consideration to a specific sub-type—for example, homes with three bedrooms and two baths. Figure 3 shows the histogram for exactly these sales. Note that the variation from the average price does decrease slightly, and the average price does change from $120 in Figure 2 to $125 in Figure 3. However, once again many of the sales occur at price points that are more than 10% away from the average price per square foot within this sub-type of home. Here, the region outside of the dashed red lines contains 41% of the sales. This is likely because the 3 bedroom 2 bath homes still contain substantial variation in style, upkeep, location, and other factors which have an important influence on the overall price per square foot. In other words, an accurate price prediction must take into account more than just the home type and square footage. Using these two factors alone leaves substantial room for error as Figure 3 shows. There are situations, however, when using the average price per square foot alone may be a reasonable approach for estimating property value. If, for example, the property was part of a neighborhood developed within a short period of time by a single builder, then it would be likely that these homes would all be a similar age and that they would also share many other common characteristics. If many of these properties were sold within a short period of time, then market variability would not play a significant role in pricing. In such a situation, we should see a much stronger correlation between sale price and size than in Figure 1 with lower variation from the average price per square foot than in Figures 2 and 3. 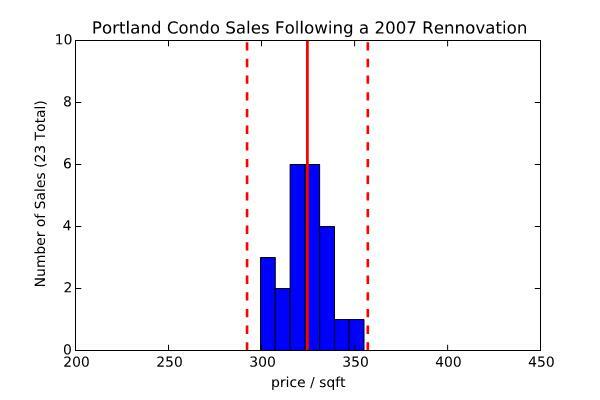 Indeed, looking at a 2007 renovation of a Portland, Oregon apartment building in which 23 units were subsequently sold as condominiums shows an extremely good correlation between sale price and size (Figure 4). In this specific situation, all sales are within 10% of the price predicted by the average price per square foot. Each point, representing a single sale, lies within the shaded yellow region, unlike in our previous plots. The tight relationship between sale price and size is also reflected in the histogram (Figure 5) where red dashed lines show the region that is within 10% of the average price per square foot. While price per square foot can be an excellent predictor of sale price as in the case of the renovated Portland condominium sales, real estate valuation is rarely this simple. As we saw in Figure 3, narrowing properties to a specific class (e.g., three bedroom, two bath) may not substantially improve the accuracy of a price prediction based on average price per square foot. What we are left with is an uncomfortable, but often unavoidable situation. However, without appropriate review and analysis, how could anyone tell whether the property they chose to use as an indicator (or rate per square foot) was one of those properties that were on the line or off the line? Remember, our example suggests that three out of five sales vary 10% or more from the average, or norm. This means that if you pick a property, or even a small group or properties, to use as indicators of sales price per square foot, and use those rates per square foot to multiply by your subject property’s square footage, you only have a 40% chance of being within 10% of a true market rate. We feel that the value added by a professional appraiser applying an appropriate process of “adjustments” to account for differences in property characteristics is the better way to analyze market value. Simply choosing a sales price per square foot from a sale in the market place, then multiplying that rate times the square footage of your subject is not enough to produce a reliable market value estimate. Pacific West Appraisal Services, Inc.
Ralph Olsen is the President and founder of Pacific West Appraisal Services, Inc. He has a Bachelor of Arts Geography, Western Washington University, Bellingham, Washington. Mr. Olsen has been an active real estate appraiser since 1977. Scott Wallace is an Associate Professor of Computer Science at Washington State University Vancouver and holds a Ph.D. in Computer Science and Engineering from the University of Michigan, Ann Arbor. Dr. Wallace’s current research focuses on applied Artificial Intelligence and Data Mining. He has actively published in leading Computer Science conferences and journals for the last 14 years.